Better for your dog's gums, teeth and your slippers. It's our tasty Flexi Bone. Our Flexi Bone is designed to meet the chewing needs of teething puppies, senior dogs and other light chewers. Puppies and Senior dogs have delicate teeth that can be damaged by harder chews, therefore we have developed a softer pliable bone that will prevent damage to their teeth. 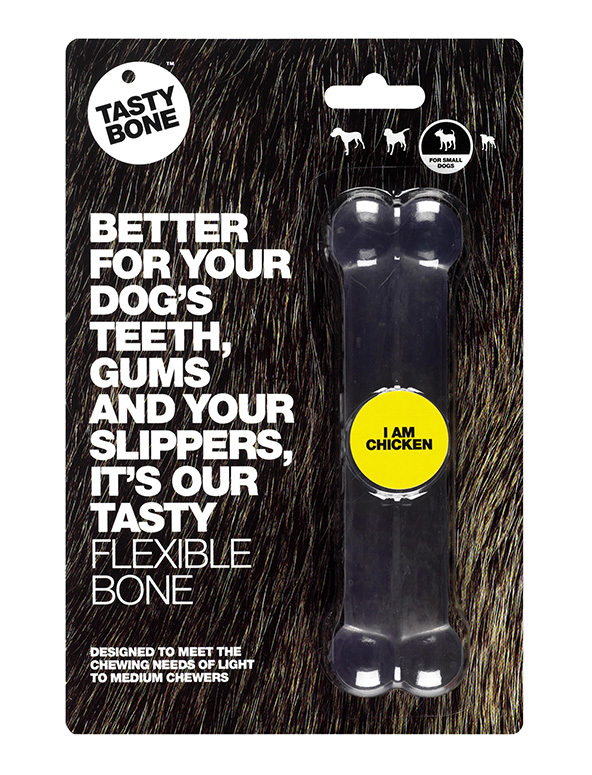 Like our other products, the Flexi Bone is infused with an irresitible Chicken flavour right through to the core, meaning it stays super tasty for longer. This Flexi Bone is designed for toy, small and large dogs. This TastyBone can be cleaned using tepid water. Do not throw Flexi Bone for your dog to catch, the impact could damage their teeth. All breeds of dog are different, please choose a product larger than your dog’s mouth. As a dog chews the bone, small rice sized pieces will naturally shave off, these pieces are safe for your dog to ingest and will pass though their system without causing harm. Dogs should be supervised with all TastyBone products, once the bone becomes smaller than your dog’s mouth it should be removed immediately and disposed of. It is the responsibility of the dog owner to ensure that this product is suitable for their dog, all dogs vary in size and chew strength. Note that this product is not recommended for strong chewers.